The beginning of a new school year is always an exciting time for students and teachers. Classrooms are organized, and feelings of hope and opportunity hang in the air next to the freshly decorated bulletin boards. With great reflection and care, teachers begin to build their guided reading workshop schedule. A few years ago, Sally was one of the thousands of talented and dedicated teachers spending hours preparing and reflecting on how to best initiate this year’s reading workshop, and now she was ready. Sally looked around her first grade classroom and smiled. Her room was impeccably organized. Her kidney-shaped table and guided reading materials waited at one end. A well-thumbed and tabbed copy of Jan Richardson’s, The Next Step Forward in Guided Reading sat near her guided reading notebook next to the tubs of leveled readers, small white boards, markers, her timer, reading notebooks, sticky notes, running record sheets, and comprehension cards. At the poetry center, 10 large, laminated poems hung from the chart stand, with two colorful pointers ready for eager readers’ hands. The six laptops at the listening center were loaded with electronic books. Pens, pencils, and paper sat patiently waiting for stories to be written and illustrated at the writing center. Sally always made sure the writing task was linked to the reading or writing workshop topics, creating echoes throughout the lessons. And the buddy reading center was purposefully located near the classroom library which was well-organized by genre and level. Every student’s book box had at least six up-to-date just-right books. Sally carefully planned her 75-minute guided reading workshop block to the minute: 12 minutes for her class focus lesson, a few minutes of transition time, and 60 minutes to complete three guided reading groups. She labored over the schedule, planning how she could meet with striving readers five days a week, those at or near benchmark three to four days a week, and highly proficient readers twice a week. As students progressed, she would reassess her groups, shifting students from one to another, trying to best meet the needs of her 25 first graders. On the first day of the reading workshop, Sally completed her read aloud during the 15-minute focus lesson, she rang a chime signaling her 25 students to move to their stations. Within two minutes she was positioned with her first guided reading group at her table. The other 20 students checked the color-coded schedule posted on the board and moved to their assigned centers. No matter how much Sally prepared for this moment, her reading block would not go as planned. Several of her students would not engage in the independent centers in the way that many of her other students would. Sally then saw Joey, Angelina, and Tanwa perched on colorful pillows with their book boxes on their laps. From a distance, one might not notice that Tanwa’s buddy reading book was upside down. At the independent writing center, a few students had been busy decorating the edges of their paper instead of writing a story. Sally is not alone. This scenario plays itself out every day in classrooms across the country. How can educators reach some of the students in classrooms nationwide who struggle to use their independent center time the way it is intended? These students are often our striving readers who are not accelerating. They may have some literacy skills in place but cannot work independently or focus without constant direction. As a teacher, Sally worries about this a lot. What Jan Richardson and I have found through our work on the RISE framework (Reading Intervention for Students to Excel) is that most of these striving students thrive on an intense and focused burst of literacy training for a short period of time. 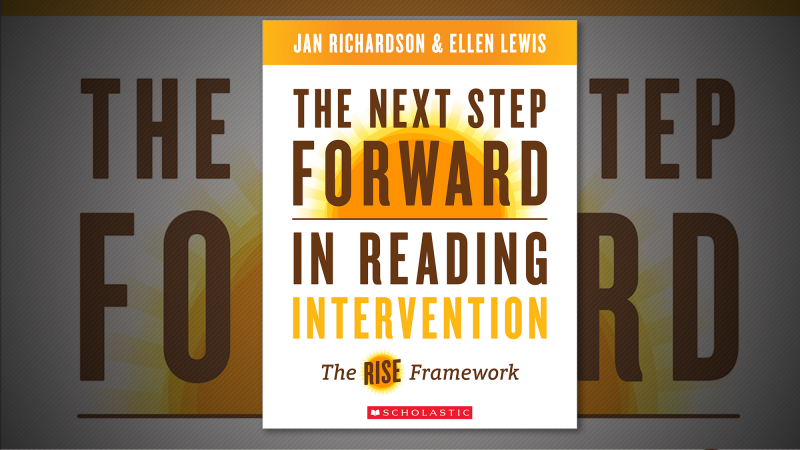 The RISE framework offers a 6–8 week solution for helping these striving readers. As featured in The Next Step Forward in Reading Intervention, this framework is based on Jan’s guided reading lesson and adapted for the intervention setting. Schools can be effective by using their existing staff and space to help striving readers in a targeted intervention that creates and nurtures independent problem solving—a critical skill needed for reading and in life. It’s important that we don’t let students become lifetime members of the reading intervention club, but get the focused attention that they need and quickly rejoin the rest of their classmates as they continue their learning journeys. They will be newly confident in their literacy skills and ready to thrive in a supportive and organized classroom, just as Sally’s striving readers did after they received the intervention they needed. Striving readers want to become better readers. Targeted and focused literacy instruction is what many striving readers need to help them succeed as joyful, independent readers, for the rest of the school year, and beyond.